South Africa definitely met this requirement. In fact, she called me up the day before and said “you’re not going to JOHANNESBURG are you? !” That probably didn’t help. 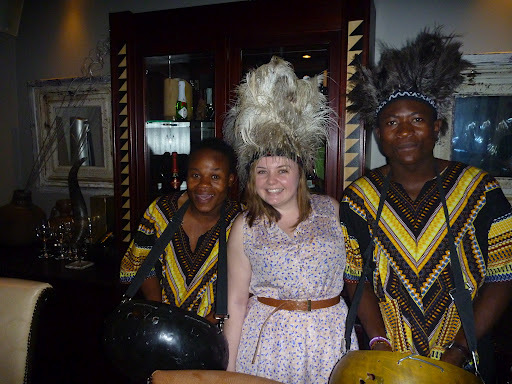 However, I actually have quite a few lovely South African clients who helped get me excited. I think, above all, I knew just how much I was going to miss Boyfriend. Fighting jetlag, we touched down in Johannesburg (OR Tambo Intenational) and I started to realise just how non-scary the place is, and not only that, but how at home I felt right away. Sure there were a few differences, such as the airport signs directing you to “Customs”, “Baggage Claim” and the ominous “Firearms Import/Export”! I clutched onto my handbag for dear life fairly sure it would be snatched (I’d heard the stories) and kept an eye on everyone. Of course, I walked away completely unscathed. Dinner on the first night was at Tribes, an African themed restaurant, and hosted by the lovely Erik from South African Tourism. If there’s one thing I can say about South African cuisine… they love their meat! Jeff had the “mixed grill”: 4 steaks – Ostrich, Kudu, Impala and Warthog. I stuck to the beef. One thing that really struck me was the scenery. Eucalypts everywhere! I felt so at home. Eucalypts are a pest over there but it definitely helped me realise that sometimes one side of the world isn’t really all that different from the other. The people were just as friendly, the food was just as tasty, and the views were just as beautiful. There are some cultural differences though, and for me (an ironing freak) I found it extremely hard to handle the idea that I had to call someone to come and do my ironing for me. Apparently, South Africans find it just as strange that I would do my own ironing!